This is the Action Bundle 3, a GoPro external lavalier microphone kit for your GoPro Hero3, Hero3+ or Hero4. 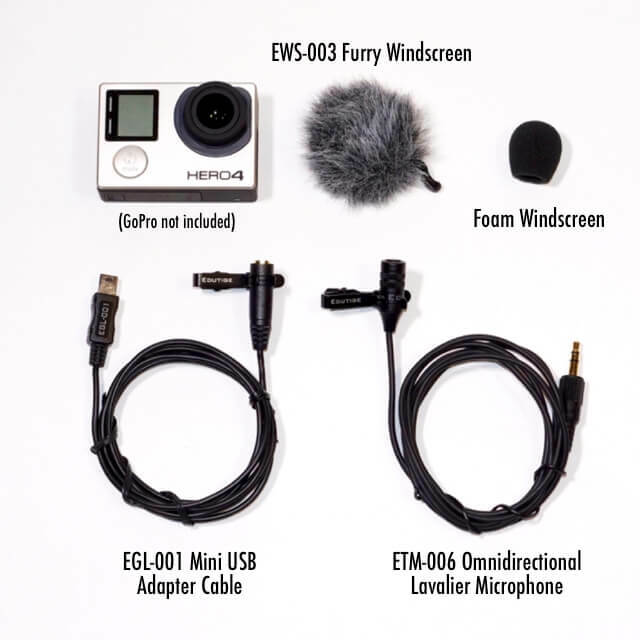 The bundle comes with the ETM-006 omnidirectional lavalier microphone, the EGL-001 mini USB microphone adapter for GoPro, and the EWS-003 furry windscreen. The Action Bundle 3 is a great GoPro podcast or vlogging set up because of the flexibility and options you have with a lavalier microphone. 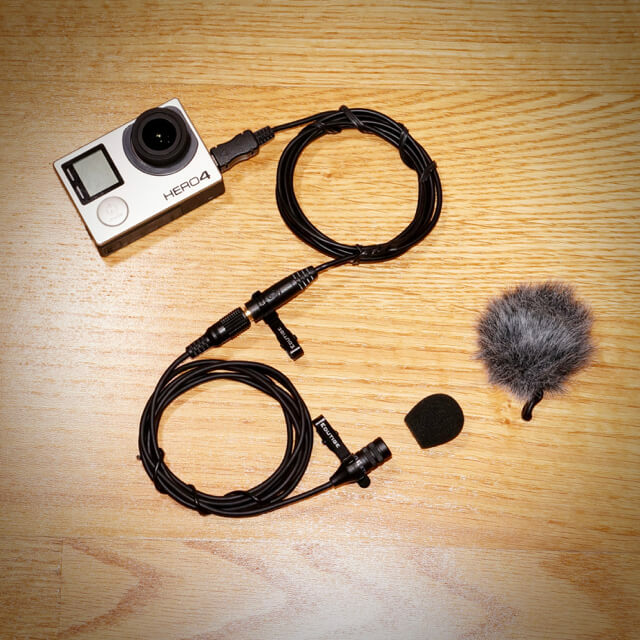 The Action Bundle 3 is for GoPro users that need a longer cable and a way to clip/attach a microphone to either yourself or an object. The ETM-006 is an omnidirectional microphone so it picks up your voice plus the sounds of the environment. This GoPro external lavalier microphone bundle is great for general purpose, travel and vlogging, especially with the longer cable of the ETM-006. If you don’t want so much of the environmental sounds to be captured and only want one sound source, like your voice, then look into the Action Bundle 2. The Action Bundle 2 has the unidirectional ETM-008 microphone that helps reject sounds from the sides and back of the mic. The GoPro Hero4 was set up using the Superview function. I like Superview because it’s easier to get yourself in frame without needing to pull out your phone and checking. I was probably less than 3ft away from the camera. The ETM-006 was attached to my jacket with the cord tucked inside and out the bottom, then to the EGL-001 and the GoPro. Try to keep the cables hidden whenever you can because it just looks better and less amateur. The shots of the Action Bundle were filmed with my Sony NEX-5N and Sigma 30mm EX DN f2.8 lens, but I could have achieved a similar result with my iPhone 6. Editing was done in Final Cut Pro X.